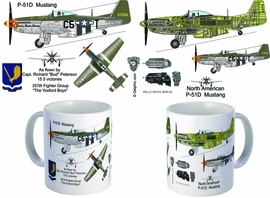 One one side is a P-51 Mustang cutaway and the other side is Capt. Richard "Bud" Peterson's Hurry Home Honey and emblem of the 357th Fighter Group, the Yoxford Boys. He was known as the "shepherd in the skies" because of his skill in guiding fellow pilots to safety during World War II. 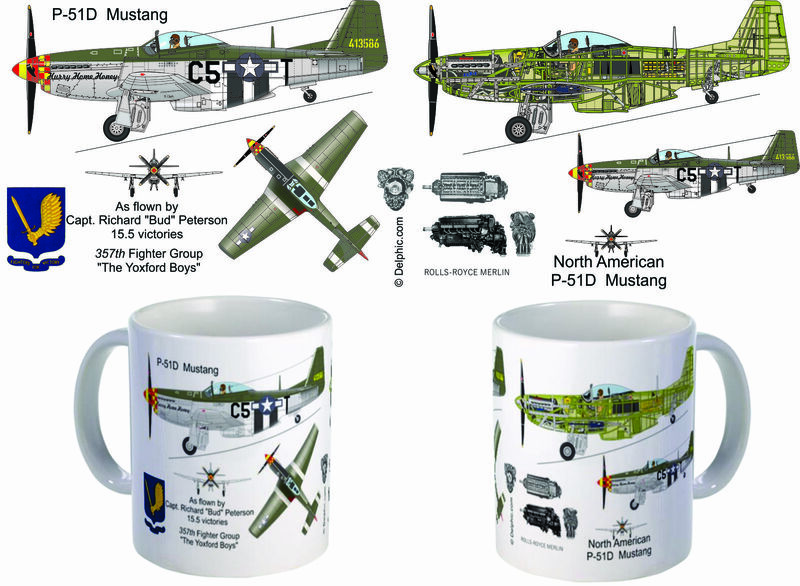 He named his P-51 "Hurry Home Honey" after the manner which his wife signed each of her letters. During 150 missions over Europe, he shoot down 15.5 enemy planes. He became a major at age 21, at the time the youngest person to achieve that rank in the Army Air Force. He was later awarded the Air Medal, the Silver Star and the Distinguished Flying Cross. He also received the Croix de Guerre, one of France's highest honors for bravery. After the war he was selected as a staff officer to interview Adolf Galland, commander of the German Air Force fighter forces, on aerial combat tactics and strategy.